The victims of the poisoning were found to have levels of lead in their blood, which were 17 to 22 times higher than the minimum international standards. Lead poisoning is a type of metal poisoning caused by lead in the body. The brain is the most sensitive. Symptoms may include abdominal pain, constipation, headaches, irritability, memory problems, inability to have children and tingling in the hands and feet. Apart from the most recent lead poisoning attack, which happened in 2015, a childhood lead poisoning outbreak related to gold ore processing had been conﬁrmed in two villages in Zamfara State, Nigeria in 2010. Studies carried out in illegal gold miners residential compounds and villages in Zamfara State in the same year revealed that 17,000 people were affected while an estimated 400 to 500 children lost their lives to the dreadful disease. Regrettably, five years after the Zamfara outbreak another severe lead poisoning was reported on April 2015 in two villages in Niger State, which killed 28 children. Despite the efforts of development, medical, and environmental experts both locally and internationally lead contamination continue to afflict large number of children. The practice of mercury amalgamation at mining sites has also resulted in widespread contamination of miners and others working near the mines. Nigeria has an average of 21.37 tonnes of gold deposit from 2000 to 2018, and reaching an all time high of 21.40 tonnes in the first quarter of 2018. Gold deposits are found in Northern Nigeria, most prominently near Maru, Anka, Malele, Tsohon Birnin Gwari-Kwaga, Gurmana, Bin Yauri, Okolom-Dogondaji, and Iperindo in Osun State. At present exploitation of gold deposits is being carried out mostly by artisan miners in a few places in the country, who may not be aware of the health implication of such activities in the environment. A number of primary deposits, which are sufficiently big for large-scale mechanised mining, have been identified in the northwest and southwest parts of the country, but not much has been done by the Federal Government translate it to income generating revenue. Apart from the health hazards from illegal mining of gold in the country, Nigeria is said to be losing about $9 billion yearly to illegal mining and gold exportation, a huge amount of money unaccounted for through under the radar sales of the expensive commodity. Specifically, the country is losing about 100 kilogramme of gold every day as a result of illegal mining of the precious resources. Nigerian Extractive Industries Transparency Initiative (NIETI), which recently confirmed the illegal mining activities in Nigeria, said in its recent Solid Mineral Sector Audit Report that activities of unlicensed miners were becoming prevalent within the industry, leading to loss of government revenue. The Audit decried the incessant smuggling of solid minerals out of the country by middlemen and smugglers. The Audit had observed persistent activities of some foreign nationals operating in the sector, which constitute significant buyers of solid minerals that are mined by artisanal and small scale miners, illegal miners resulting in inaccurate production records and revenue leakages. NEITI also observed that some expatriate companies do not keep their accounts within the country and also prepare their accounts in language other than English. It sighted example with Mercury Mining Investment, a Chinese company located on Benin – Ore road, Ofusu, Ondo State. In order to prevent further loss of revenue, NEITI urged the Federal Government to encourage unlicensed miners to formalise their activities by obtaining licenses accordingly. NEITI therefore called for the establishment of minerals buying centres to provide market access to small scale miners; formation of cooperative societies by artesian miners; access to funding and extension services by small scale miners; and government should encourage big operators to collaborate with artisanal miners in the management of rich mineral deposit areas to maximize mining revenue in these areas. It said that any company that does not keep its books and correct records in Nigeria and does not prepare its accounts in English language should be sanctioned accordingly and investigated by Federal Inland Revenue Services (FIRS) for tax evasion. It also called for the establishment of mineral market at strategic boarder points across the country in order to bring about flexible market control. Burdened by these quantum of loses, the House of Representative has therefore resolved to probe the reported loses in gold tax revenue and illegal mining in Nigeria. Honourable Ehiozuwa Agbonayinma from Edo State, during plenary session last week, said that the reports from NEITI indicated that Nigeria lost about $9 billion to illegal mining operations and gold exportation from 2014 to 2015. He quoted a report from Signal One International (SOI), a U.S-based company, as saying in a 2016 report that Nigeria has lost over $50 billion in gold revenue tax in two years as a result of illegal mining and exportation of unprocessed gold. Beni Lar from Plateau said that even though such illegal practices experienced in the mining industry is the same within the oil and gas sector, there is a better tracking of oil and gas, adding that more should be done to secure the industry. The Vice President, Professor Yemi Osinbajo last month called on miners in the country to comply with the regulations on safer mining to ensure safety of lives and environment. Osinbajo said that while the Federal Government has pursued National Gold Purchase Scheme as well as the development of a National Gold Policy, he noted, that gold mining in Nigeria is currently dominated by artisanal miners who are using rudimentary mining methods and crude processing techniques. He added: “The obvious consequence is the exposure of miners, environment and local communities to serious dangers in areas where gold ore contain high concentration of heavy metals like lead, exposure to the dust released by these methods lead to serious health consequences to the person directly involved in the mining, and also for all the neighbouring area. The Vice President noted that gold mining in the country is clearly dominated by artisanal miners using rudimentary mining methods and crude processing techniques. The obvious consequence according to him is the exposure of miners, the environment and local communities to serious dangers. Minister of State, Mines and Steel Development, Abubakar Bawa Bwari said “The critical lesson we must learn is that no matter the scope of remediation and treatment, there will always be some re-contamination, there will always be children who do not respond to treatment, and there will always be people willing to defy the dangers of mining gold using unsafe practices,” he noted. He maintained that the only effective long-term solution in ending further lead exposure is through behavioural change, and the use of appropriate and economically feasible technologies. The Minister said that the ministry is pursuing with vigour formalisation exercise that groups artisanal miners into licensed cooperatives and supports them with working tools and training on the use of safer mining and processing methods. This according to him is in addition to the continuous monitoring of Artisanal Small Scale Miners (ASM) gold mining activities for the purpose of monitoring lead and other heavy metals level in land, air and water in order to prevent lead and other heavy metal contamination of the environment. Though, the artisanal gold miners may be generating revenue from operations, they believed that assistance from the Federal Government would enable operators take better care of the environment and contribute to economic development. 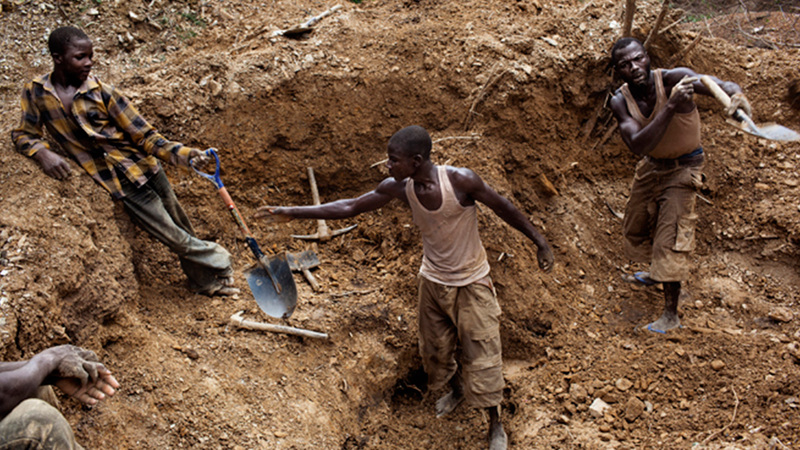 The Chairman of the Association of Gold Miners in the Chanchaga Local Government of Niger State, Michael Abida, said that his group has asked government to organise the local miners professionally. The miners want the government to help them create and join cooperative societies, as well as issue them licences, provide equipment and train them on modern mining techniques. The said that such support would, in turn, help them reduce their environmental footprint and prompt them to pay taxes. According to Abida, government has had to turn the blind eye to illegal mining operations due to the high unemployment rate that affects the country. Abida said that the gesture would also expose the miners to modern techniques in mining and ensure that the artisans paid taxes to government. The chairman said that the miners would surely pay back if government introduced them to modern mining techniques and provided equipment to them. “We want government to organise us into corporative societies and train us on new methods of mining considering local content and issue licenses to us. “We also appeal to government to provide us with locally fabricated machines so that in the end we will pay revenue to government and service our loans,’’ he said. Abida said that in the past, the state government was not comfortable with illegal miners as they were arrested, but now there was no such thing. The miner said that a point of gold was sold for N1, 500 or at least N1, 200. Abida said that there were also marbles in Chanchaga River, the mining site, but no market for it yet.